Welcome to another Crafter’s Companion Friday’s post. I don’t have a new release to share today but I can’t get enough of these beautiful florals in the Art Kure in Bloom collection. It makes for such elegant and timeless cards and here is mine to share. All the Art Kure florals fit perfectly with the Spellbinders oval dies. My Irises were colored using Spectrum Noirs (LV1, LV2, LV3; DG2, DG3). I sponged around the Irises with some distressed ink to make the image pop. Patterned paper is from American Crafts and twine is from Doodlebug Designs. The translucent pearls you see are actual liquid pearls from Viva Decor. I hope you give this Crafter’s Companion Art Kure collection a 2nd look – it’s beautiful. 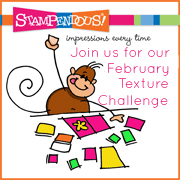 It’s Stampendous Saturday again – time to enter into Feburary’s Stampendous challenge – it’s all about texture this month - use flocking, embossing powders, glitters, mica fragments, dry embossing etc. … you name it – if it adds texture, get it on your project! Here is my card with tons of mica flakes and embossing enamel on it – it was so mesmerizing to watch all the embossing enamel melt into the dry embossing. Due to shipping restrictions, the winner must have a US address. We hope you get a chance to play along with us – happy stamping! And a quick note about the linky tool below – it’s the exact same collection that is being shared on the Stampendous blog, and some of my teammates’ blogs. You can add your direct link to your project featuring texture here on my blog, or any of the other blogs that are sharing the collection! My dear Emma – I look at these photos of you laughing your lungs out and I have no idea what you were laughing about. It certainly doesn’t help that I’m only scrapping it now – 1.5 years after the photo was taken. My dear readers – my point is: PLEASE write it down! I know – it IS easier to preach than to practice tho’ … I’ve been saying “write it down” to myself for years but when the time comes for me to write it down, I can’t find a pen/pencil and by the time I get around to finding a pen/pencil, I already forgot what I am supposed to be writing now… hmmm. So my simplest 2012 resolution: have a pencil/pen with me all the time, behind my ear is a good place to keep it (nerd-alert!) … so anyhow, for now, I’m content with just smiling at her laughing picture and know that she is loved and happy. My papers are from Basic Grey, My Mind’s Eye and some from my stash. Those magnificant eye-catching stamps on the background are from Stampendous – Cling Jumbo Dahlia and Cling Jumbo Romantic Border. LOVE those Stampendous cling jumbo stamps! Those cutesy flowers are from Pebbles. And you may ask how I did those giant half circles – traced from my dinner plates and dotted with liquid pearls! Oh and I should mention that you can’t buy those Cling Jumbo Dahlias at the Stampendous website anymore but you can get them at the Michael’s store this spring. I have another post for Crafter’s Companion this month of December. What struck me as I was looking at all the projects on the Crafter’s Companion challenge blog was that there are no cards with only sentiment on it – not 1 that I saw, nah dah! And for those of you who know me, know that I need to buck that trend and take on a challenge. I wasn’t sure if a company that made cute image stamps could also make sentiment stamps well enough to hold it’s own. So I made a card with just 1 Crafter’s Companion sentiment from the Popcorn the Bear Someone Special stamp set. You still have time to use any Crafter’s Companion stamp (sentiment or image) to join us in this month’s Sparkle Challenge. I’m so honored to be invited to join the Crafter’s Companion design team as their guest for the month of December. I absolutely love Popcorn the Bear and Souffle the duck and I have recently discovered Humphrey the Elephant. Actually, while I was writing this post and browsing the Crafter’s Companion website at the same time, I also discovered The Ultimate Tool as well – measure, cut, score, emboss, embellish all in 1 tool. I could make cards, gift boxes, envelope, there is even a peg to make bows as well! Wow – what rock have I been hiding under and guess what I will be asking for Christmas this year! The theme this month is “Sparkles” – not an easy theme for me. I’m more of a die cutting, embossing, stamp and color kinda gal. I do embellish with pearls and twine or ribbon just because I love the clean and neat linear lines. So I’m rolling up my sleeves this month and taking on this challenge of going outside my comfort zone. I actually had a blast experimenting with all the different mediums to try and create “Sparkle” on my card. I used glossy accent to sparkle up the ribbon around Popcorn’s wreath, the berries on the wreath is “colored” with Stickles, the rest of Popcorn was colored in Copic markers. I then edged the focal image was with Viva Deco Inka-gold paste, ribbon had a touch of sparkle from my stash and my DP had some with metallic accent from Kaisercraft. Are you all sparkled out yet? I hope you will enter this month’s Sparkle Challenge and don’t forget to check out all the great stamps and products at Crafter’s Companion too. Wait, there is more – if you want a chance to win the ENTIRE set of Spectrum Noir Alcohol Markers, join us for a Christmas blog hop from December 9th to December 11, 2011. Hop starts at the Crafter’s Companion USA information blog.